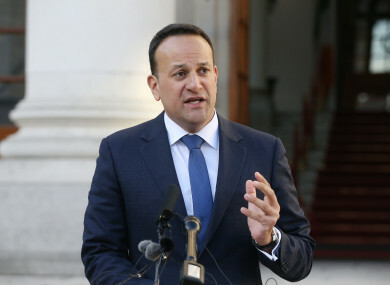 TAOISEACH LEO VARADKAR said the Irish government “profoundly regrets” Westminster’s rejection of Brexit deal, adding that a no-deal scenario would have a “deeply negative” effect on jobs and the economy and peace in Northern Ireland. Speaking to the media this morning, he said the deal on the table will ensure a hard border is avoided and will protect the rights of citizens in all parts of Ireland. “The ball is in Westminster’s court,” he said. A disorderly Brexit at the end of March can be avoided, with the extension of Article 50 – but that can only be done when a request is made by the UK government. Work on Ireland’ contingency plans will continue, but Varadkar said “these are no longer contingency plans, they are being implemented by government”. He said businesses and other organisations must now do the same. Varadkar said the Irish government are not planning for checks along the land border – only at ports and airports. He said a soft border isn’t just achieved by wishful thinking, stating that it can only be achieved through an agreement, on customs and regulatory alignment. The Taoiseach also faced questions about a private conversation between Transport Minister Shane Ross and Tánaiste Simon Coveney yesterday. At a media briefing there was tension during a media briefing when Ross was asked if food shipping driven into Ireland would require checks. Ross answered: “I’d imagine there would be checks…”. Coveney quickly interjected stating, “Well, no…”, and stated that the issue will be thrashed out with EU and UK if the agreement fails. The Irish Independent reports today that a recording of their conversation between the two ministers after the press conference finds that Ross asked if he should not have said that, with Coveney stating that once you start talking about checks anywhere near the border, the government could be blamed as the administration that reintroduced a physical border on the island of Ireland. Varadkar said the Irish government can’t shift on the issue of there being no hard border. “That is the outcome we need. We’ve said it from day one,” he said. During Leaders’ Questions in the Dáil, Fianna Fáil Micheal Martin raised the conversation between Coveney and Ross stating that “it’s like the episode of Fawlty Towers, where people are told not to mention the war. It seems someone forgot to tell Minister Ross”. He said it seems to be very much the case of “God, don’t mention the border” – but he questioned the secrecy and lack of clarity for the public. “What the Tánaiste was referring to was checks on goods moving from the Britain to Ireland… that’s what the withdrawal agreement provides for,” said Varadkar. The Taoiseach said “this problem started in Westminister with the Brexit referendum, we found a solution, they rejected that solution, now they need to come back with something they can get through parliament but it also has to be something the European Union and Ireland can accept”. Speaking on RTÉ’s Morning Ireland, Tánaiste Simon Coveney said Ireland must hold its nerve in the weeks ahead. “There is so much still to happen in Westminster in the next few days before it becomes clear what Britain is asking for. “It’s hard for us as EU leaders to respond in a helpful way if we still don’t know what they are asking for,” he said. Appearing before the Oireachtas Budgetary Oversight Committee, Finance Minister Paschal Donohoe said a review of Ireland’s economic forecast will take place a lot sooner than it normally would in light of last night’s vote in Westminster. He said the vote is “exceptionally disappointing and concerning”. He admitted that the “central scenario” that he based Budget 2019 on, was that a Brexit deal would be agreed with the UK. Explaining this reasoning, he said that at the time he was carrying out his “budgetary arithmetic that did look like the most likely scenario”. Donohoe said his department are now doing a further assessment on the possible impact on Ireland’s economic forecast “given the scale of the defeat last night”. He added that he did not believe the Budget’s expenditure plans would be impacted this year. He said he has told his department to carry out the economic forecast “far earlier than we normally do” adding that he is looking for it to be done “as soon as possible”. The new forecast will look at what a disorderly Brexit will be, but told Fianna Fáil’s Michael McGrath that it would be “heavily caveatted” the department is being tasked to form a view “on an event that has never happened before”. Never in history has a country left a trading block in this manner, he explained, stating that any scenarios are based on “assumptions, upon assumptions, upon assumptions”. He said it is “very difficult to be absolutely clear” as to what would happen with no regularity alignment. Concerns surrounding Ireland’s over reliance on corporation tax in light of Brexit were also raised with the minister. McGrath said corporation receipts account for €10.4 billion in 2018 – stating that it has close to doubled on the 2015 predictions. Given that a small number of large corporations are contributing to the fund, McGrath said a further report on predictions out to 2020 should be carried out. Donohoe said he is aware of the concerns, adding that it was a contributing factor to why he decided to increase the hospitality VAT rate. He said including such measures as the VAT rise in the Budget will help reduce Ireland’s reliance on corporation tax in the future. Email “Varadkar says Brexit 'ball is in Westminster’s court' and there are no plans for checks along NI border”. Feedback on “Varadkar says Brexit 'ball is in Westminster’s court' and there are no plans for checks along NI border”.